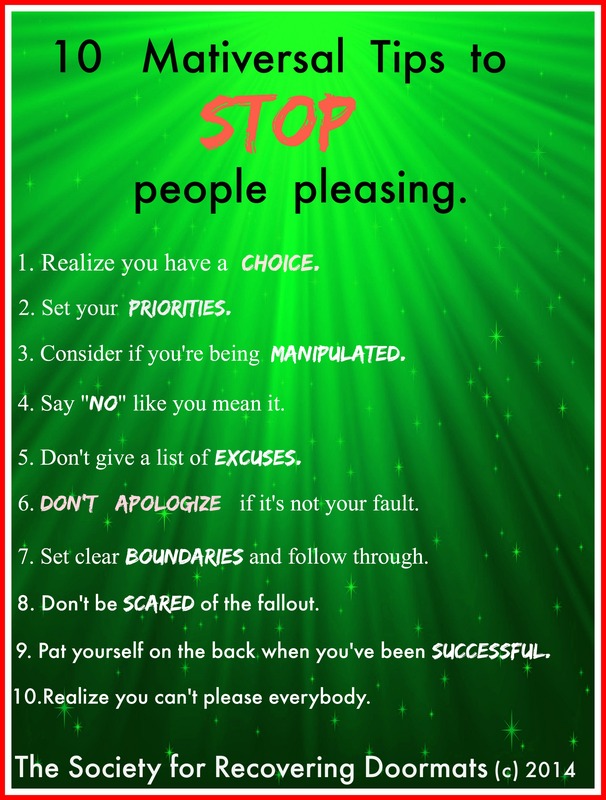 10 Mativersal Tips to stop people pleasing. This should be on the refrigerator of everyone in the Society! You should make it into a magnet. Fall out is not about you! It has to do with a control freak not getting his/her way. This should be everyone’s mantra..
My favorites are #1, 4, 5, 6, and 10. Giving excuses and apologizing were the hardest steps for me. Especially at church. I helped with preschool child care for several years, and finally just didn’t want to do it anymore. My first inclination was to make excuses and apologize, “I’m so sorry, but my arthritis…” But I stopped myself. Even though that was true enough, it wasn’t the real reason, and why should I have to explain and apologize? I volunteered for 3 years, why should I feel guilty! So I just said, “I’ve enjoyed it, I just don’t want to do it anymore.” The director developed “fish mouth”; I just smiled and walked away. I’m still welcome at the church, by the way. Hi Mary, we are all “scared of the fallout”. But there comes a time when you have to just take a chance. Stand up and speak out and not worry about “what other people will say” or “what will happen.” As long as you are not intentionally hurtful to anyone, you have a right to be YOU. To voice YOUR opinions, have YOUR needs met. And to let people know when they’ve hurt you. Hope this inspires you to live your life YOUR way. <3 Rose G.
Once you start addressing your people pleasing ways, it gets easier. Thanks for stopping by today.